Washington Center resident Amelia Bolio turned 102 March 26 at the Washington Center in Argyle. Bolio is a lifelong resident of Glens Falls and Argyle. The celebration began with approximately 35 students from the Argyle Central School chorus, who kicked off the event. 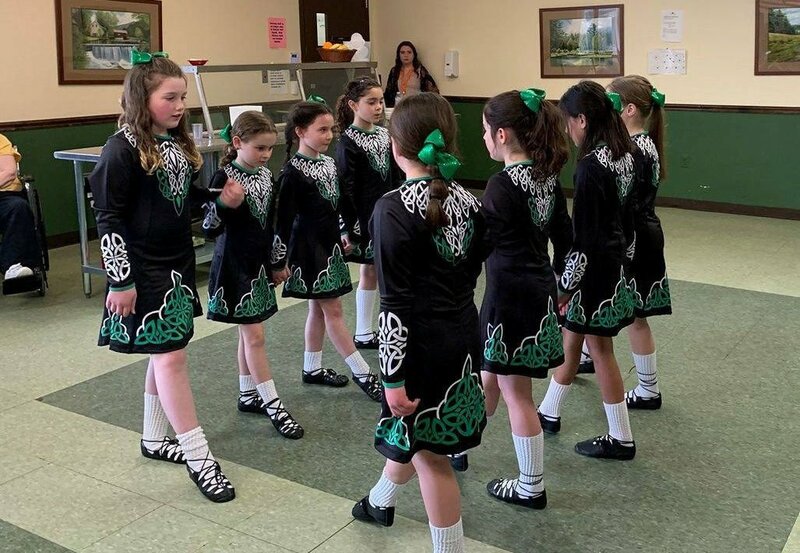 Mise Eire Irish Dancers from Saratoga visited the Warren Center in Queensbury March 24. They entertained the residents and staff for 45 minutes. Members of the Salem Rotary Club, including Cindy and Tom Rogers, left, Dan and Valerie Sheldon, David Higby and Nancy Artz, participated in SUNY Adirondack's "The Howl" Trivia Night, placing third among a pack of 26 competitors. The spirited event raised money for the student scholarship fund. LAKE GEORGE — The Caldwell Lake George Annual Library Dinner will be at 5:30 p.m. Thursday at the Holiday Inn in Lake George, celebrating National Library Week. There will be a basket raffle, musical entertainment by the Lake George students and a dinner buffet. Tickets cost $25. All proceeds go directly to the library. RSVP by Monday by calling 518-668-2528. LAKE GEORGE — The Lake George Historical Association will hold its annual meeting and dinner at 6:30 p.m. Friday at the Lake George Holiday Inn. This year’s guest speaker will be Dr. David Starbuck, archaeologist and professor, speaking on archaeology in the Adirondacks. The public is welcome. To make reservations, call the association at 518-668-5044. The Association was formed in 1965 by residents of Lake George with the interest in preserving and exhibiting the history of the region. The building housing the association’s museum is the Lake George Institute of History, Art and Science (formerly the Warren County Courthouse) and was dedicated in June 1970. GRANVILLE — Granville High School will host a public forum, “E-Cigs, JUUL & The Youth Epidemic: What Parents and Teachers Should Know,” from 6 to 8 p.m. Wednesday at the school. Sarah Cosgrove, education coordinator, and Alan-Michael Saltis, prevention coordinator, will present the facts about vaping and e-cigarettes, and discuss the local and national initiatives to reduce youth vaping. The event is free and the public is invited to attend. Those interested in attending should register at www.RRMC.org or call 802-772-2400. CAMBRIDGE — Saint Luke’s Church will be the lead parish for the Lenten Luncheon at noon Tuesday at 4 St. Luke’s Place, sponsored in partnership through the Cambridge Council of Christian Churches. There will be a short spiritual message with music presented by the lead church, followed by lunch, dessert and beverage at no cost. LAKE GEORGE — The Caldwell-Lake George Library has announced the artist of the month for April is Betsy “Elizabeth” Krebs. Artwork from her “Roots & Branches” collection will be on display at the library during the month of April. Inspired by events that occurred in the Old Stone School House, a historic building located in the Town of Lake George, “Roots and Branches” depicts a visual account of “The Lend A Hand” club, a unique community known for its humanitarian efforts in the early 1900s. An opening reception will be held from 6 to 7 p.m. Friday. Refreshments will be served. This event is free and open to the public. Contact the library at 518-668-2528 for further information. NORTH RIVER — A spaghetti dinner will be held at the North River United Methodist Church, 194 Thirteenth Lake Road in North River on Saturday, April 13, from 4:30 p.m. to 7 p.m. Menu will be spaghetti and meatballs, tossed salad, bread, beverage and dessert. Take outs are available! Free will donation. For more information regarding this event, please contact Roxie Freebern at 518-251-4129. Fuller has been growing and harvesting plants and herbs for more than 40 years. She has conducted many workshops in the Northeast, including ones for Glens Falls Hospital and Mary McClellan Hospital. Fuller maintains an office at the Shirt Factory in Glens Falls, where she offers herbal consultations and teaches herbal classes. In “Introduction To Herbal Medicine,” Fuller will discuss plant-based medicinal systems, using plants for nutrition and well-being, choosing the right plant for specific conditions, the correct preparations to use and proper dosages. This program is free and open to the public. Space is limited. Preregistration is required. Contact the library at 518-668-2528 for further information. CAMBRIDGE — St. Luke’s will be holding its chicken barbecue from 4 to 6 p.m. Saturday at 4 St. Luke’s Place. Dinner includes half a chicken, potato, cole slaw, vegetable, roll and dessert, priced at $12. All dinners are packaged as take-out, or enjoy the company of others in our dining room. Pick up meals between 4-6 p.m. at the Parish house. Pre-sale tickets are available from church members and at the Parish house from 10 a.m. to noon on Sundays and 10 to 11 a.m. Wednesdays before April 13. Limited tickets to be sold at door on the day of event. For questions or tickets, call Bobbie at 518-677-8341. WARRENSBURG — Beth Kinghorn was recently elected to the presidency of the Board of Directors of the Warrensburgh Historical Society. A recent addition to the board, Kinghorn returned to Warrensburg in early 2018 from Virginia. Born and raised in Warrensburg, she graduated from Warrensburg Central School in 1980, and moved to Richmond, Virginia, where she earned a bachelor’s degree from Randolph-Macon College and a master’s degree from the Presbyterian School of Christian Education. While Beth’s primary career has been as an educator, she is also a writer and is starting a business as a professional organizer. She is the proud mother of two grown sons. Other officers elected to the board are immediate past-president Paul Gilchrist as vice president, Margaret McMahon as secretary and Candice Healy as treasurer. The board also includes Dorothy Langworthy, Liz Sebald and Mark Brown. Directors are elected for 3-year terms. Town Historian Sandi Parisi and Museum Director Steve Parisi are permanent, though non-voting, board members. The Warrensburgh Historical Society operates the Warrensburgh Museum for the town of Warrensburg. It also hosts periodic programs open to the public and conducts an educational outreach to both the elementary and junior/senior high schools. A Graveyard Walk is held in the fall. Membership currently stands at more than 160, both individual and business. Its current principal fundraisers are the Annual Sticky Wicket Croquet Tournament and an annual kayak raffle. The society can be found at www.whs12885.org and on Facebook, at both Warrensburgh Historical Society and Warrensburgh Museum of Local History. The museum, located at 3754 Main St., is open from noon to 4 p.m. Wednesdays and 1 to 3 p.m. Sundays. Admission is always free. FORT ANN — The West Fort Ann Volunteer Fire Co. will host breakfast with the Easter Bunny from 7 to 11 a.m. Saturday at 49 Joe Green Road. Menu includes pancakes, sausage, eggs, bacon, corned beef hash, French toast and home fries. Adults cost $7; kids ages 5-12 cost $4. Kids get photo and a treat. TICONDEROGA — Ticonderoga resident, historian and author Maury Thompson will present a program on local figure Charles Evans Hughes at 7 p.m. Friday at the Ticonderoga Historical Society, 6 Moses Circle. Thompson will speak about Hughes and his regional connections, and will show a segment from a documentary in progress about Hughes and the Adirondacks. Thompson is the author of “The Animated Feather Duster: Slow News Day Tales of the Legendary Facial Hair of Charles Evans Hughes.” The book chronicles the career of Hughes through historic newspaper and magazine reporting about his trademark whiskers. It was publisher William Randolph Hearst who referred to Hughes as “The Animated Feather Duster,” a nickname that would stick with him throughout his life. FORT EDWARD — The Fort Miller Reformed Church will be hosting a roast beef dinner from 4:30 to 6 p.m. Saturday on River Road in Fort Miller. In addition to roast beef, there will be gravy, herbed potatoes, corn casserole, carrots, cole slaw, rolls, Hawaiian cake and beverages. Eat in or take-out meals are available. Adults cost $12; children under 12 cost $5; children 4 and under are free. No reservations needed. CORINTH — Learn about how to protect yourself and your family from tick bites and tick-borne illnesses such as Lyme disease at a free program from 11 a.m. to noon Friday at the Corinth Free Library, 89 Main St. This free program features Elizabeth Herlihy and Shana Phelan from Saratoga County Public Health Services. Seating is limited, so reserve a space soon by contacting the library at 518-654-6913. This program is part of the Library Moon Walk grant provided by the Southern Adirondack Library System, the Upper Hudson Library System and the Mohawk Valley Library System. WARRENSBURG — First Presbyterian Church of Warrensburg will serve a lasagna dinner from 5 to 7 p.m. Friday at 2 Stewart Farrar Ave. Menu includes meat and vegetarian lasagna, tossed salad, dessert and beverage. Take-outs are available. Meals cost $10 for adults; $7 for kids. For more information, call 518-623-5758 or 518-260-8534. CAMBRIDGE — The Operation Santa Claus Committee in Cambridge has received $1,250 from the Stewart’s Holiday Match Grant Program. Many community members generously contributed to local Stewart’s shops between Thanksgiving and Christmas. These contributions were matched by the Stewart’s Foundation. So, every penny, nickel, dime or quarter that was donated was doubled and used to sponsor programs that benefit the community. Operation Santa Claus is sponsored by the Cambridge Faculty Association. OSC uses grant money to provide clothing for children in need during the holiday season and into winter. If an unexpected family need arises, Operation Santa Claus will step in to help. The goal is to have all children in Cambridge warmly clothed in winter and watched over for unexpected events. The Stewart’s Holiday Match helps us reach out when needed. CAMBRIDGE — The Cambridge Historical Society and Museum meets at 6:30 p.m. on the second Monday of each month at the Cambridge Public Library from January-April and at the Museum from May-December. The goals are to preserve and protect the great Cambridge area’s history, both in physical and written form. The museum is dependent on families offering items for short-term exhibit or permanent display to be used for educational insight, as well as volunteers to conduct tours, archive items and conduct programs. Planning for the 2019 season is being finalized and will include the annual plant sale, chili supper, Victorian tea, educational programs and strawberry shortcake event. For more information, email cambridgehistoricalsociety@gmail.com. WARRENSBURG — The state Department of Environmental Conservation and Warren County Cornell Cooperative Extension will host a workshop on the hemlock woolly adelgid from 5 to 8 p.m. Thursday at the DEC Region 5 Office, 232 Golf Course Road in Warrensburg. The hemlock woolly adelgid, a tiny insect from East Asia first discovered in New York in 1985, attacks forest and ornamental hemlock trees. Charlotte Malmborg, a natural resources technician with the state Hemlock Initiative at Cornell University, will provide information on the importance of hemlock trees in northeastern forests, the threat presented by HWA and how landowners can identify and manage HWA infestations. She will also introduce the state Hemlock Initiative’s research of biological control opportunities and describe the role of NYSHI in promoting hemlock conservation in New York State. DEC Forester Jason Denham will present on the invasive pests; emerald ash borer and the spotted lanternfly. He will provide an update on their status in New York, and how these invasive pests could be expected to impact the Adirondack Region. Participants will be outside for a short period at the beginning of the session to view hemlock trees and some of the common things found on them that may be confused for HWA. The DEC Region 5 Warrensburg Office is wheelchair accessible. The workshop is free but participants must register with Dan Carusone at 518-668‐4881 or email at djc69@cornell.edu. Attendance is limited to 75 people. Hometown is compiled by Gretta Hochsprung. If you’d like to let her know about an upcoming event, email ghochsprung@poststar.com or call 518-742-3206.